Information presented on this page is intended to demonstrate the agreement in results between a trusted source and those which have been calculated in the member design module. 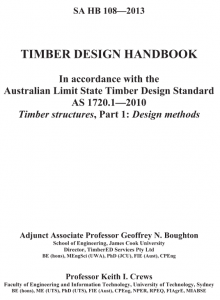 All examples are taken from The Timber Design Handbook HB-108-2013 published by Standards Australia. NOTE: Calculations in the Timber Design Handbook HB-108 – 2013 round values to 3 significant figures however, SkyCiv does use this approach. Values in SkyCiv are calculated with maximum accuracy and reported to 3 decimal places which may cause some minor disagreement between values in the following comparisons. Remarks: In this example, r has been set to 1 for the purpose of checking the accuracy of the calculated results however, normally SkyCiv assumes a value of 0.25 which is conservative an may reduce the capacity of the member by approximately 15-20% if there is a stress reversal in the member for the governing load combination or if the member is designed to carry mostly temporary loads. Future versions of the software may include the calculation of r.